Do you have an heirloom now sitting in the dust and shadows of an attic or basement? Bring it to light! A custom lamp highlights your object and puts it center stage. Bring it to the store for consultation and leave with a beautiful and functional work of art. This sort of custom made lamp can make a wonderful wedding or housewarming gift, with sentimental as well as functional value, something that can be treasured for years to come. We can also refurbish old lamps with replacement shades, parts, lamp wiring and updating as needed. Our wiring staff will inspect your lamps and provide you with a free estimate. Generally lamp repairs can be done within a week. To top it off, we have a stock of varied and unique lampshades at the shop to complement your new, unique lamp. We use a variety of materials, such as mica, parchment paper, laminated fabric, and special art papers to create our lamp shades. The use of nature designs, leaves and grasses, and techniques involving oil paints, watercolors, and hand cut papers, allows us a wide range of decorative styles: Tribal, Arts and Crafts, Art Deco, Asian, Southwestern, and Contemporary to name a few. Can’t find the perfect one for your lamp? We will create a custom lamp shade especially for you! All of our lamps are made at our Berkeley shop by Sue Johnson with the help of our experienced lamp wiring staff – Hank Schmutz and Jorge Villegas. We enjoy searching for wonderful hand-crafted objects to turn into unique and engaging lamps. From outside the area: Please do not send us your objects without contacting and discussing your project with us in advance. We are available by phone at 510.527.2623, fax at 510.527.2047, and email moc.s1555920106pmaln1555920106osnho1555920106jeus@1555920106ofni1555920106. Generally we advise getting your electrical work done locally to avoid not only the dangers but the costs of shipping. 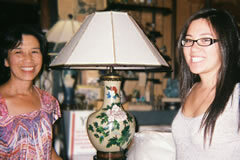 Let us know what your perfect custom lamp looks like and we can help you create it.